I posted this item for your examination not too long ago. I was able to pick it up today so I now have some more images with closer shots of the details. Would you have any further comments? Thank you! Does the scene refer to anything specific? Also what characterizes Tongzhi-Guangxu? As an artist, I am curious! Thank you for your expertise Peter! Possibly, but sometimes it is difficult to know what this depicts. 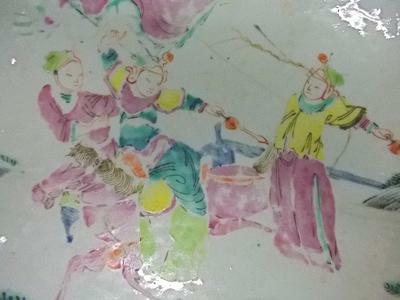 This would probably be called a warrior decoration in the west. 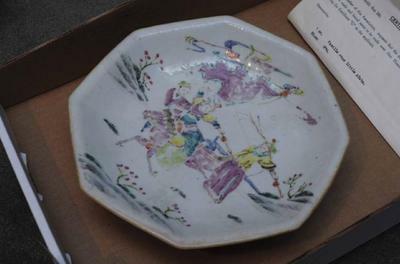 It is indeed from the Tongzhi/Guangxu period. 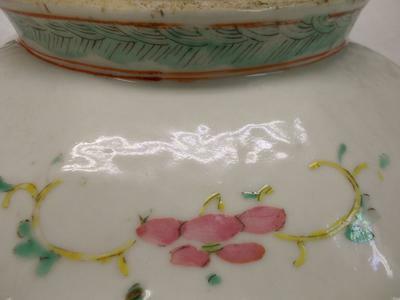 I was hoping you could give me an opinion on this little plate which I also purchased this morning at the same online auction. Although it comes with a certificate, from what I've gleaned from the info your site, I don't imagine that it's particularly valuable (or old!). 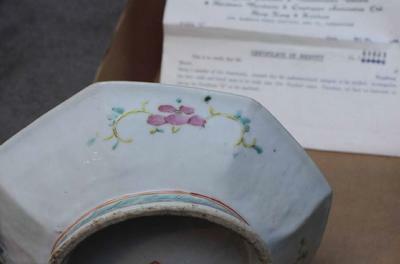 I also bought a few other small pieces (pedestal cup and an altar plate) which also seem to be examples of 'famille rose' from the same period. Shelley - Thanks so much for your comments! It's from Hong Kong. The certifacte and the item should be authentic especially when the item is not of "great" value. 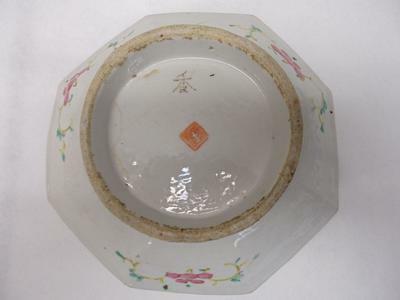 Talking about value, let me tell you that my daughter bought a vase made in 1962 in the institute of porcealine research in China for 30€ last year in HK and I saw the estimation for similar item is 300 to 1000 US$. Also, at the Chinese Arts and Crafts department store in HK, brand new porcelain vases are easily 3 or 4 thousand euros! Peter - Thank you for such a speedy response! 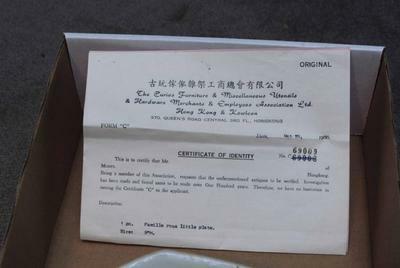 Unfortunately, I believe the certificate DOES originate from China. I will examine the items more closely when I pick them up on Saturday. Would need to see some closeups of faces/people (partial is fine), and the bottom. Could be late Qing but I would need to verify this. 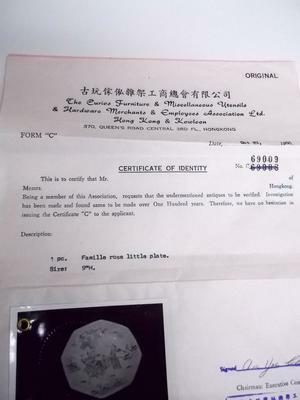 The certificate could be fine, if not from China. The problem with fake certificates is concerning those coming from China. Not a high value item.